South Africa’s labor disputes and shortages of platinum, palladium for catalysts. The country is the best source for metals critical for making lower-emission vehicles. Mineworkers take part in a march at Lonmin’s Marikana mine in South Africa’s North West Province, Sept. 5, 2012. In May, security officials confronted 500 protesters at a chromium mine in Rustenburg, South Africa. Rubber bullets were fired, and 10 people were hospitalized. 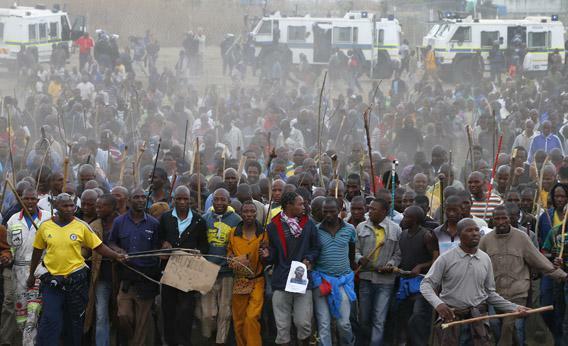 This is just the latest in a series of wildcat strikes turned violent in South African mines. Most notably, 34 miners died during a confrontation between miners and police in August at a platinum mine in Marikana. These strikes are the result of rapidly deteriorating labor relations in the South African mining industry. Mining companies are facing increased financial pressure from rising costs and low global metal prices. They must also contend with rolling blackouts, which is crucial in the energy-intensive mining industry. This harms routine mining production and profits. As a result of these difficulties, companies are considering downsizing and laying off workers in an attempt to return to profitability. Understandably, mine workers are not happy about the possibility of losing their jobs. They are also demanding higher wages because their salaries are not keeping up with the rapidly rising cost of living. To top this all off, rival labor unions are attempting to win workers’ support by making seemingly impossible-to-meet demands of mining companies. For instance, the National Union of Mineworkers wants to increase wages for gold and coal miners up to 60 percent. The rival Association of Mineworkers and Construction Union—which has successfully poached enough members from the NUM to represent a majority of platinum miners—is expected to put in similarly ambitious wage demands. Together, these challenges have contributed to souring relations, sporadic work stoppages, and violence in South Africa. This pressure will only increase in the coming weeks as all parties work to renew a labor agreement. This may seem like a disturbing but purely domestic issue. However, the outcomes of these talks could have serious effects around the world, especially in the automobile industry and for the environment. That’s because South African–mined platinum group metals (PGM) are vital to reducing vehicle pollutant emissions worldwide. The metals are used in catalysts—car components placed in vehicle exhaust streams. These catalysts cause chemical reactions that lower tailpipe emissions. Without functioning catalysts, it’s difficult to imagine how car manufacturers would be able to meet emissions regulations around the world. And without platinum and palladium—the most common PGM used for vehicles—catalysts would be ineffective, more expensive, or both. Gasoline vehicles rely more on palladium, diesel vehicles on platinum. South African mines supply 73 percent of the world’s platinum and 36 percent of the world’s palladium. Worldwide, 67 percent of palladium demand comes from gasoline vehicles, and 40 percent of platinum demand comes from diesel vehicles. In the right conditions, precious metals initiate chemical reactions that convert harmful pollutants into inert compounds. Platinum and palladium are the most effective at the temperatures and gas composition of diesel and gasoline exhaust. As of yet, there are no optimal alternate metals for platinum and palladium in catalysts. That’s because platinum and palladium are chemically superior and just right for the temperature and gas-makeup conditions in diesel and gasoline exhaust. Substituting them would be like replacing Goldilocks’ porridge with one that was too hot or too cold. The good news is that there are some other PGMs that could be potential substitutes—but those options are either more rare or are also supplied by South African mines. For instance, rhodium is also used in some catalysts, but it, too, is sourced from South African mines—and costs more than palladium. Other known stocks of PGM are either diminishing rapidly (Russia) or are found in politically unstable countries (Zimbabwe). Meanwhile, vehicle sales are increasing worldwide, and emissions standards are being implemented or tightened, particularly in developing countries like China. In 2012, palladium demand for catalysts reached a record high due to increases in Japanese and North American car manufacturing as well as a rapidly growing Chinese vehicle market. The same thing is happening with platinum catalyst demand because of increased diesel vehicle manufacturing in Asia and North America. Finally, demand is also escalating because of stricter emissions regulations for non-road diesel vehicles (such as construction and agricultural equipment), which have historically not been as well regulated as on-road vehicles. That’s why there will be global ripple effects if the South African mining labor disputes are not resolved. Without productive mines, we’ll continue to see demand for platinum and palladium outstrip supply. That, in turn, could potentially delay emissions regulations—just as a rapidly modernizing developing world is increasingly adopting personal vehicles—and cause further environmental damage as well as health problems for those breathing in urban air pollution. Beyond a sustained settlement to labor negotiations, a temporary solution could be to promote the recycling of the metals. For instance, due to relatively low prices of PGM last year, many collectors in Europe and North America hoarded stock of used catalysts that would otherwise be recycled and could help ease supply deficits. However, recycling would only be a temporary solution because hoarded stocks will be sold and exhausted as metal prices rise. Another source of recycling is in countries implementing stricter emissions standards. For example, recycling of palladium is expected to increase in China as more vehicles are adopting catalysts, and as the government enacts new regulations requiring older, higher-polluting vehicles that were originally fitted with less-efficient catalysts to be scrapped. This will result in improvements in the recycling capacity and infrastructure in China. But even with a better recycling infrastructure, the growth of vehicle ownership in China means that new metals would have to be introduced into the system before recycling is utilized as a significant source of palladium. This problem demonstrates the importance of resilience in a manufacturing system. The supply-chain shocks to PGM supply from South Africa threaten global catalyst manufacturing. Vehicles must use catalysts to achieve emissions regulations. Catalysts must use PGM to be effective. PGM is primarily available in South Africa. If any part of this chain is weakened, the whole process is threatened—and it’s impossible to count how many other critical systems suffer from the same lack of diversity. Ultimately, the only long-term solution is to strengthen the vehicle emissions control technology supply-chain by developing new methods to control toxic pollutants or more robust sources of catalyst material. Without enhancements to this system, disruptions in South African PGM output could have the potential to weaken catalyst production and air quality around the world.